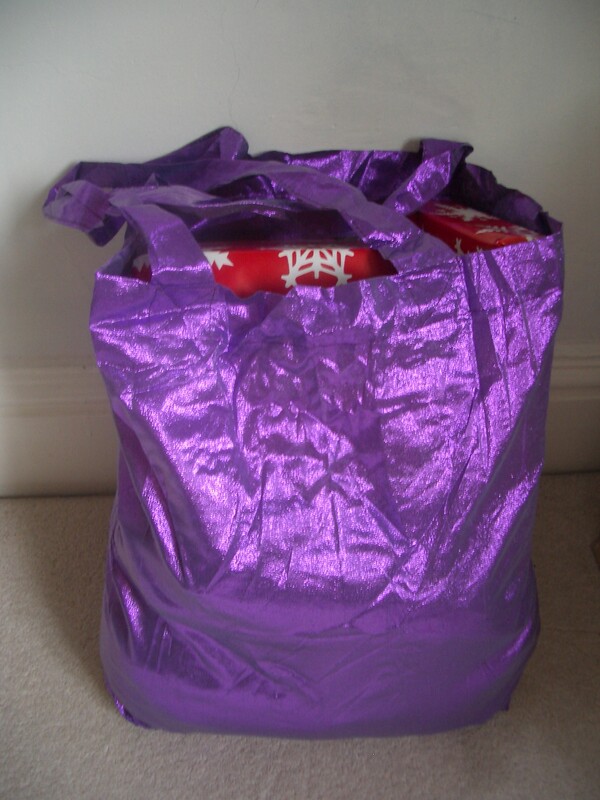 These days a lot of shops charge for carrier bags, which means it’s useful to have a bag in a small pouch that can be carried about in a pocket or handbag until you need it. Make it from metallic nylon and it’ll look fabulous as well as being very strong, lightweight and taking up virtually no space at all. This type of nylon is almost see-through and can often be found for sale cheaply on market stalls. It frays very readily so don’t cut it out before you are ready to sew and avoid handling it any more than necessary. The weft is flat strips of nylon which will catch on a needle that is anything less than super-sharp, which means you’ll need a new needle in your sewing machine. Pins need to be sharp too. 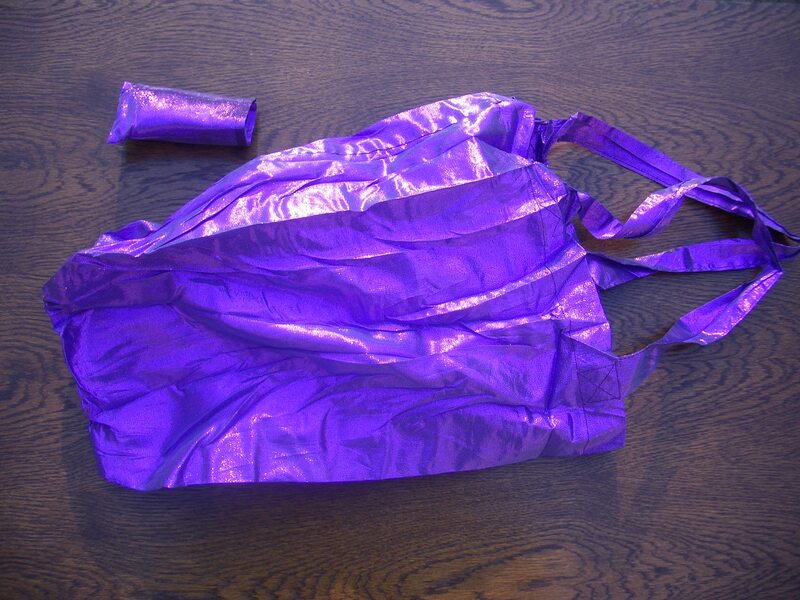 1m (1¼ yd) of 114cm (45″) fabric is enough to make two bags. If your fabric is a different width, then you might want to vary the dimensions of the bag to avoid cutting it to waste. Cut the strip in half lengthwise to give two 8.5cm x 54 cm strips, one for each handle. Sew the long edges of the strips, right sides together, in a narrow seam. Turn them right sides out, press with a cool iron. Tuck in the ends to hide the raw edges and tack them. Topstitch all 4 edges close to the edge. Press. The bag is made with French seams for added strength and to prevent fraying. Start by folding the rectangle so that the two short edges are together, right sides out, and sew these two short edges in a narrow seam – this is the bag’s side seam. Press the seam to one side, turn it wrong sides out, press it again, trim any fray-ey bits off and then sew it again, right sides together. Press to one side. Sew the bottom seam, again as a French seam. Press to one side. Turn under 1.5″ to the inside at the top of the bag and press. Turn the raw edge under by ¼” to make a hem and tack it in place. Press. Attach the straps. 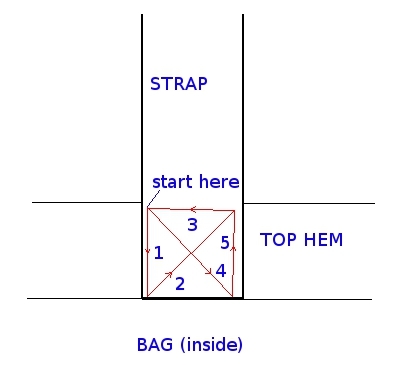 On each side, the end of a strap should be positioned about 1/3 of the way along the top of the bag with the strap end on the inside and level with the bottom of the hem. Sew close to the edge of the strap and the top of the hem. 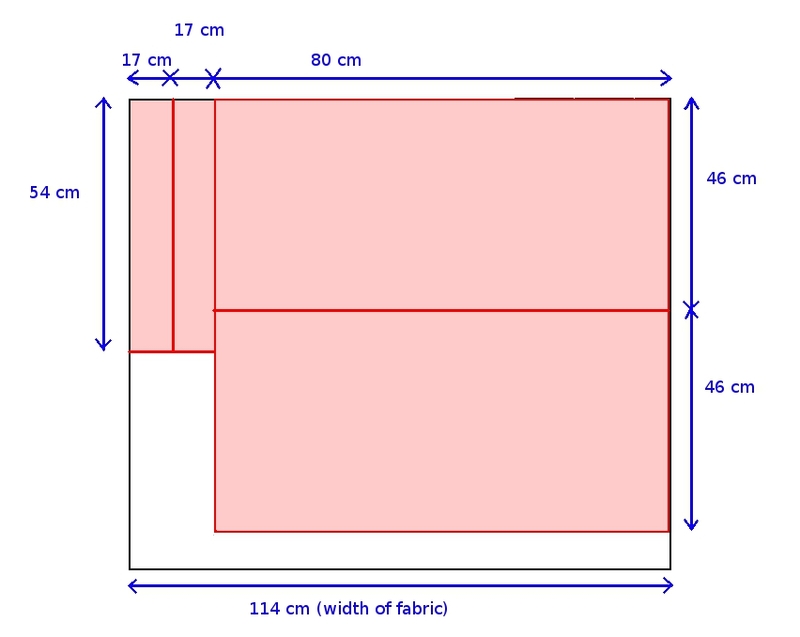 Starting at a top corner, sew straight down to the bottom corner, diagonally up to the opposite top corner, along the top of the hem, diagonally down to the opposite bottom corner and then vertically up to the remaining top corner (see diagram). The final side of the rectangle, the lower edge of the hem, will be sewn in the next step. Repeat on the other side of the bag with the other strap. Now sew right round the top of the bag close to the turned under edge, making sure to catch in the strap ends. 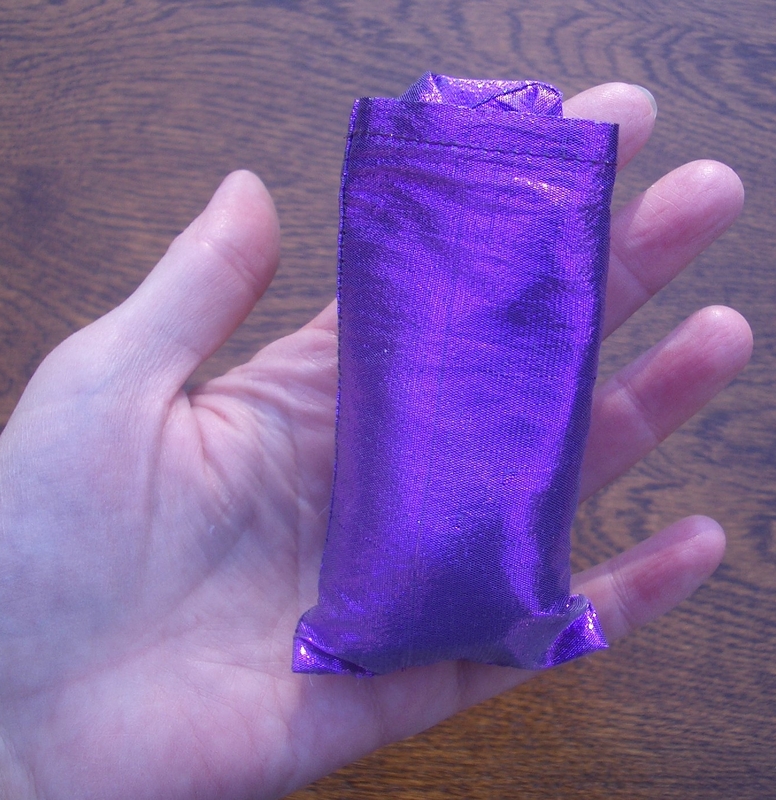 Finally, make a little pouch from leftover fabric. Fold your bag up as small as it will go by first laying the straps on the bag itself and then folding in each side to end up with a rectangle that is only 1/3 the width of the bag. Then fold it in half lengthwise and roll it up from the bottom. Hold it in place with rubber bands and measure the size of the resulting package. Make a pouch to suit, remembering to allow for seams and the hem around the top opening when you cut out. The pouch needs to be a tight fit or the slippery bag will fall out of it. To give you an idea, the pouch in the picture measures 6cm wide (12 cm circumference) by 10.5cm high.